You’re not just getting a blog post tonight, you’re getting a whole new page and a recipe! Gosh we spoil you. You can find the new page by clicking here and unusually, I’d LOVE feedback – any possible questions, things I’ve got wrong, the usual guff. 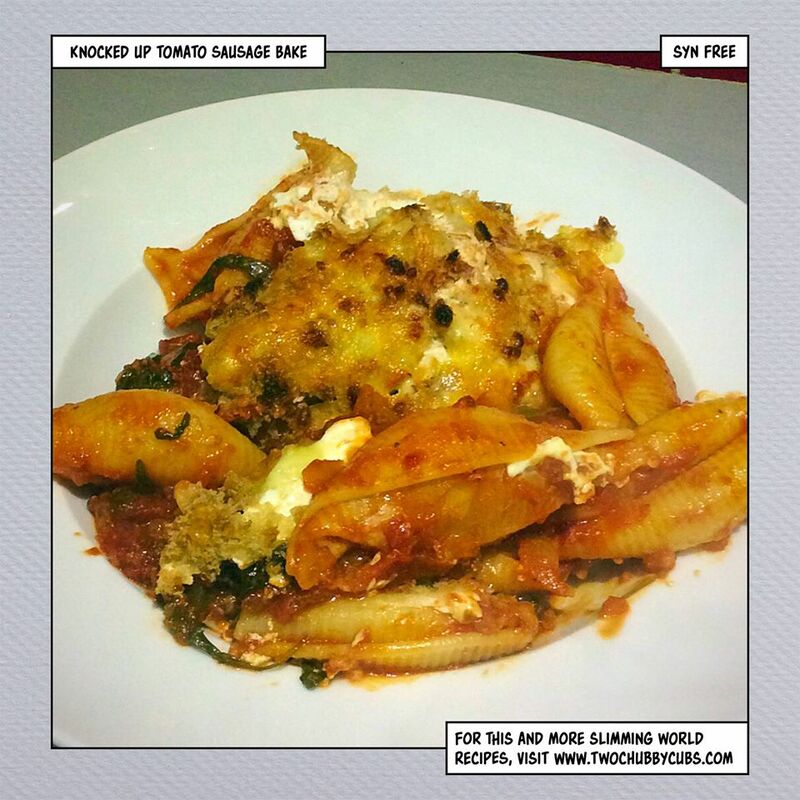 In the meantime, as a treat for us forgetting to post last week, here’s another recipe – it’s just a sausage and pasta bake but it’s the perfect vehicle for any old shite you have leftover in the fridge. Firstly, a reassurance – if you DON’T have pasta that is shaped like giant, shaven, tidy vaginas then do not worry – you can use any pasta at all in this. Use a mixture, use the drags from the back of the cupboard with the weevils crawling on it for added protein, use spaghetti, noodles, the works! It’ll be syn free as long as you use your healthy extras for the cheese (70g reduced fat parmesan) and the bread bun. ingredients: pasta, two tins of tomatoes, Slimming World sausages (syn-free, but if you want, get some very low-syn sausages and syn accordingly), an onion, garlic, reduced fat cheese, quark and a wholemeal bun whizzed up into breadcrubs. recipe: cook your pasta in water so salty it would be a sailor cry, drain and set aside. Meanwhile, chop your onion and garlic, fry it off gently in a drop of oil, add your tinned tomatoes and let it simmer down. Grill your sausages and cut into discs. Now – for our bake, we added sliced peppers, half a bag of wilting rocket and some jalapenos that were floating around in the fridge. Add whatever you like! Combine everything in a great big pan and stir it like crazy. Get it all mixed up. Chuck it into a pyrex dish. Add the quark on the top, followed by the cheese and breadcrumbs, and pop it in the oven for thirty minutes. Finish it under the grill for another five to get it crunchy. Serve! This makes four massive portions and like I said, is perfect for using up any leftover veg or pasta. It’s a very cheap and filling dish and even if you left out the sausages, would still serve as a lovely midweek meal. Goodmorning……Having just found Slimming World Recipes on line, it has made my day…..so many lovely recipes to choose from. Do hope you will keep this going and not forclose in the near future….. Keep going, its lovely to be able to slim without joining a Club..
Just found your site. It is the best SW recipe info out there. Keep it going please, though with so many gorgeous recipes there are enough to keep me going for months.